No more corrosion... No more leaks... and durable! 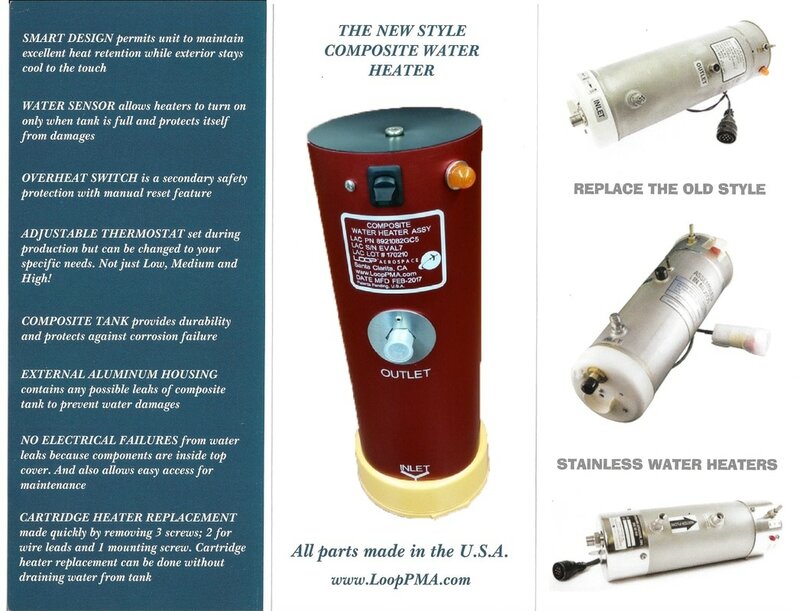 Works with our solenoid valve to convert any existing faucet into a Universal Faucet. Compact size - approximately 11 inch x 6 inch x 6 inch. Lightweight- only 5 lbs. Durable - withstands freezing environments. 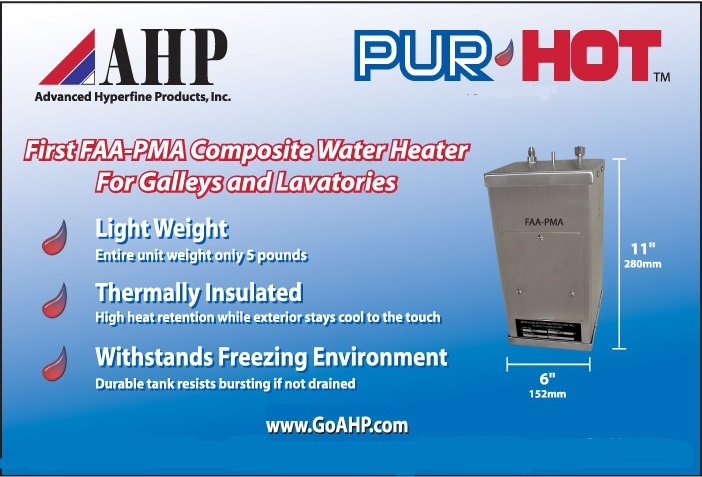 Great Capacity - 1/2 gallon with endless warm waterflow. Safety - exterior cool to the touch. Efficient - thermally insulated for heat retention and less power consumption. External Relay - line replaceable without removing water heater. Exterior Housing contains any possible tank leakage and connects to aircraft's drain system. 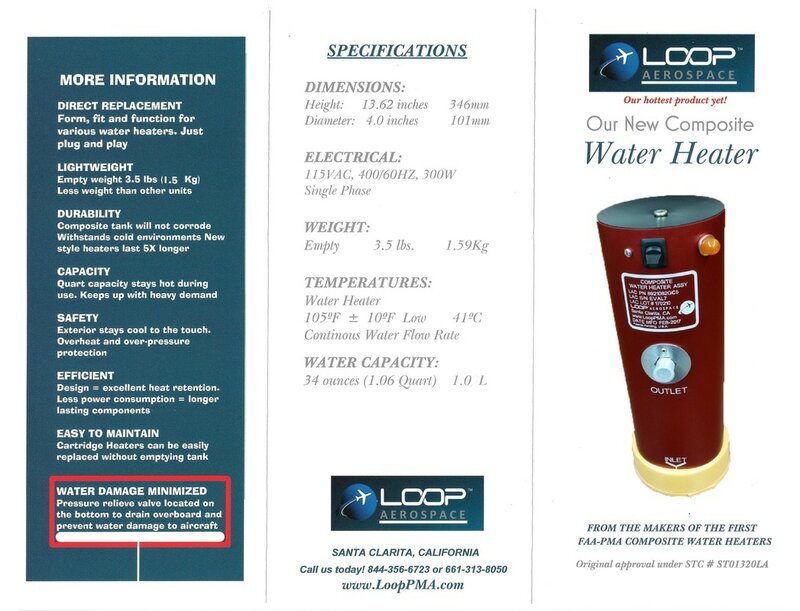 The FAA-PMA approved aircraft water heater; part number IH100-1, IH100-2, and IH100-3 are the first composite water heaters installed under Supplemental Type Certificate #STC ST01320LA. See which aircraft models are eligible for installation under the ﻿FAA-PMA Info﻿ section. No More Faucet Replacement! One part number solenoid valve replaces ALL FAUCETS in the fleet, no matter your aircraft's make, model or year of manufacture. Eliminates the need to carry various part number faucets and is easy to maintain because our solenoid valve gets mounted below the sink wherever it is most accessible.